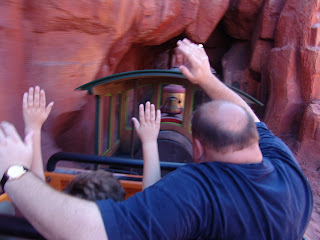 Ryan decided to give Big Thunder mountain another try. 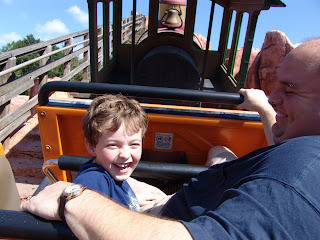 He rode it once when he was just tall enouhg and he hated it. Well this trip he got brave and he rode rides he would never ride before. 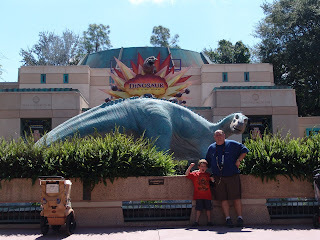 He rode the Dinosaur ride and liked it so he decided it was time to try again. Well he LOVED Big Thunder this time. He rode it 4 times. He would have ridden it more but he didn't decide to ride it until the day before we left. That looks like a fun one. OH how fun!! 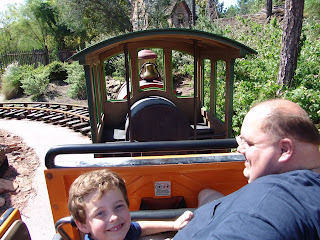 I remember both of my boys riding BTMR for the first time! I think they both liked it better the second time. :) I'm glad he loved it this time! We rode it a few times last time becasue they loved it so much. WE ended up waiting there for an hour or so in the rain. We were next in line to go on the ride and they closed it, so we just sat and waited and chatted with one of the cast members. She was the one that told us to come to Disney in October becasue the crowds are so low and the halloween party is at that time. Cute! I love the bottom left picture!